Junior Fellowships to Outstanding Persons In The Field Of Culture 2018: Only Online Applications will be entertained. Please go through the Scheme and instructions carefully before in the Aplication Form. CCRT under the Ministry of Culture invites on-line applications from Indian Nationals for the ward of Junior Fellowships to Outstanding Persons in the field of Culture for the year 2018-19. These Fellowships arewarded for undertaking research oriented projects. While both the academic research and performance related research are encouraged the applicant should provide evidence of her capabilities in undertaking the project. 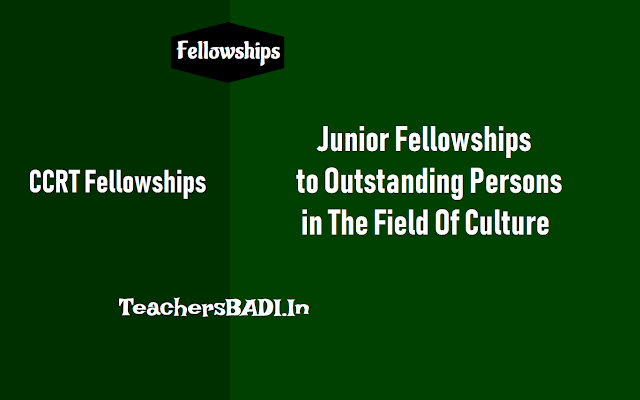 It may be noted that these Fellowships are not intended for prot-based award. Age: Age will be reckoned as on 1 April 2018 for the year 2018-19. Applicants are advised to keep a print out of the filed in application form which they will be required to bring at the time of interview/personal talong with their detailed project proposal Other documents that the candidates will have to bring at the time of interview/personal talk will be separately notified to the shortlisted candidates. All the shortlisted candidates will be informed about the date and venue of the interview/personal talk on the email address provided by them in their application. The candidates are required to remember their e-mail, password and Project Title. The names of the candidates finally selected for the award of Junior Fellowship under this Scheme will be posted on the website of SORT & Ministry of Culture after the selection process is completed and the selection is approved by the Ministry of Culture. The list of selected candidates will be posted on CORT's website www.ccrtindia.co.in & Ministre. If a candidate who is awarded Fellowship is found ineligible for it at any later stage, the Fellowship so awarded to him/her will be cancelled & money released to him/her will be recovered. months will be permissible with the approval of Ministry of Culture and without any additional financial ability to the Government. matter will be dealt within the jurisdiction of Delhi High Court only. Al awards sanctioned under the scheme shall be disbursed at present by the Ministry of Culture, Govt. of India directly to the Awardees. Notes Ministry of Culture (MC) reserves the right to reject select the applications on the basis of screening and evaluations.